Remembering a Special Man…John Hardy, Sr. It has been exactly 13 days since we lost John Hardy, Sr. He and his wife Lois were co-owners and partners with Greg & Kathy Brooks in Sub Sea Research. On Saturday, March 23rd, his family held a celebration of his life at their home church in South Gorham, ME. It was beautifully called his Home-Going Celebration. That was where I saw and learned about the whole man. I met John & Lois when I came to work for SSR in 2009. From the moment you meet them you just know they are special. First off, when they speak with you, they give you their undivided attention and really listen to what you are saying. They made everyone they encountered feel special. It was as if they had a calming force field around them both. However, I never realized how special John was, until I spent a couple hours at his memorial. As the crew and I were seated together in the church you could feel the love everywhere. As the room filled to capacity, Lois sat at the piano and played from her heart to the man she had been married to for over fifty years . After the minister welcomed everyone and said a prayer, some of John’s children and grandchildren got up and read scripture or sang a hymn, and all the while Lois sat at that piano and played with a peace surrounding her. I learned what was important in John’s life that day, and it was God, his family and his work. Those are not just words that I am saying but the absolute truth. As each person that shared their memories of John, I came to realized I had probably met one of the most kind, humble, loyal and honorable men I would ever meet. Both he and Lois touched so many lives with their words and their actions and they were blessed in return with the love of children and grandchildren. When the service ended we were all welcomed to share lunch and fellowship. I watched as Lois opened her arms to extend a big hug to each and every person who came up to her. She looked them right in the eyes with her beautiful smile and thanked them for sharing with her. I witnessed grace on that day and I will be forever grateful for having known John Hardy, Sr. 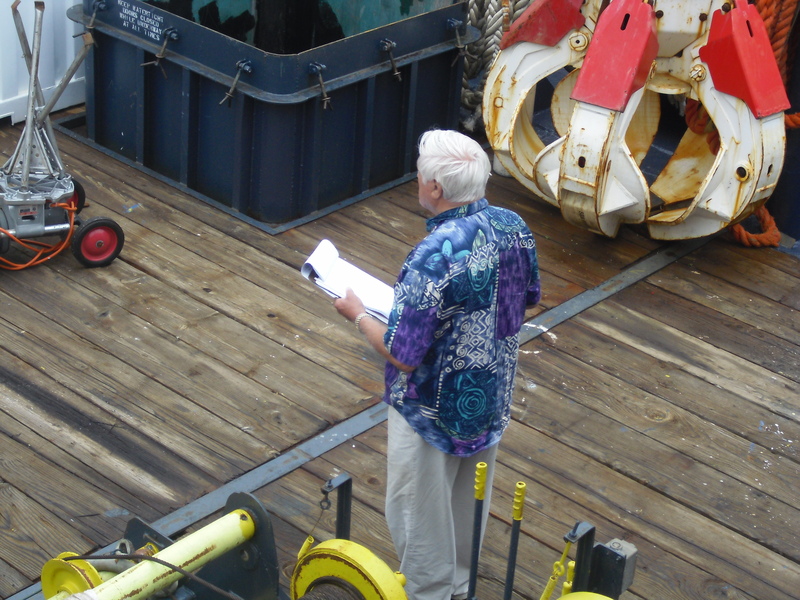 Though John will never again step aboard the M/V Sea Hunter, I know his spirit will be watching over us as we continue our work. From the crew, we thank you from the bottom of our hearts. Beautiful tribute for a beautiful man. I will always adore both John and Lois. A beautifully told story about a great man, I can’t believe he’s gone – he always seemed so timeless, He seemed just as young as when I first met him in ’71, just his hair got gray, but his mind was as sharp as ever…..Goodbye Mr. Hardy………..